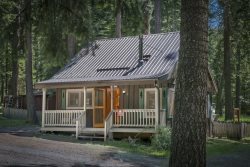 Cute knotty pine cabin located at the resort side of Wallowa Lake. The reservation and payment process is so simple and efficient. I really appreciated being able to do everything on line. I don't ever plan to use any other vacation rental company. You guys really have this business down! Wonderful time. Great property. I doesnt look like much on the outside but the inside is great and well layed out. My family and I stayed there during my sister's wedding(very stressful weekend). The Ram's Head provided us with a relaxing and calm retreat during a very busy weekend! I felt so calm and so at peace looking out the windows into the trees! It really did feel like a tree house! We will most definitely be back! Always enjoy booking with your group, quickly got the code to the door after it did not arrive in first email. Ponderosa Pines #44 was located right on the lake with access to boating and fishing right from the dock. The hot tub was a great bonus and very enjoyable each night after a long day of activites around Wallowa Lake. The home does not have a dishwasher, but could easily have been added right next to the sink, there is a lot of empty cabinet space. We enjoyed all the aspects of the home: view, dock, location, hot tub, bbq, deck, two bathrooms. Wonderful, beautiful, peaceful and quiet! Loved our deer visitors! Thank you! CP-62208ery nice area, good location. The wound of the river is great! Location is good, not too far from anything in the area. Thanks for a beautiful place for our annual reunion of sisters and spouses. It is wonderful to find a place that houses 10! Some had never been to this lovely corner of our Oregon. We absolutely loved the home we stayed at this time! We'll be back! I called to ask for check in info, the call was answered, the staff was friendly and helpful. We absolutely loved it. Very clean and peaceful. We will be back for sure! Maintenance guy came out regarding leaking faucet and he was very nice. Beautiful property with gorgeous views. This is THE cleanest rental I have ever stayed in and I have stayed in a lot of them. Kari's name was on the tip envelope, so I am assuming she cleaned the unit. Very detail oriented. She's a keeper. Great place to stay. It was quiet and peaceful at the cabin. Beautiful property, beautiful setting on the lake. We'll be back with our family. The wifi referred to on the refrigerator and counter never worked. Booked through Airbnb. Forgot to type in departure code so returned later. Our first time lakeside. Loved the dock and lake views. By the last night we'd adjusted to lack of separation of sleeping areas. Didn't have much contact with them, which shows that they run a good business! When we did have a question, Jada was very kind and answered our question efficiently. This is a great cabin for family with older kids that can handle hauling our stuff up the stairs! Didn't have to worry about gaining weight with the stairs which made us eat and drink more than we planned! Thanks for a great stay!